Alpe Adria Green awards merit certificates to the activists who distinguished themselves in the legal battle against LNG terminals in Trieste after Spanish multinational company Gas Natural withdrew the project (13 October 2018). I have recently received the decree of the Regional Administrative Court for Lazio that ends the long battle of LNG terminals, which Gas Natural wanted to place in the port of Trieste. A harsh battle, which lasted from 2005 to November 2018, when the Spanish multinational company ultimately gave up. This victory proved decisive to save the whole International Free Port of Trieste, which local politicians were willing to sacrifice to Italian interest. Their plan was to turn the port of Trieste in the main energy hub of the Mediterranean. And, to do so, getting rid of its special Free Port regime dismissing it, starting from the Northern sector (the so-called “old port”). The Southern (New) Free Port as oil and gas terminal, and the other inconvenient facilities nearby to be “empowered” (the Ferriera – Steelworks and the incineration plant). At the same time, all precious maritime trade routes were to be diverted on Italian port (Venice, Ancona, Bari, Taranto, Genoa, Gioia Tauro). Trieste’s future was arbitrarily cast accordingly to Italian interests and, once again, in breach of its legal status as Free Territory and in breach of the legal status of its international Free Port, which was to be suffocated with high-risk activities like, again, the handling of fuels (gas and oil terminal cannot coexist with any other trade) and other invasive and pollution-inducing activities (the Ferriera and the incineration plant). The story of this long stand against the LNG terminal is told in my investigative book “Tracks of Legality – how Italian corruptions and mafias pollute the Free Territory of Trieste” (LINK). And it is the story of a battle fought by few against many. Nearly all parties supported the LNG terminal, in particular Mayor Dipiazza, and there was no real opposition either. Obviously this was at the beginning, because as the project faced the first oppositions, especially thanks to the effective actions of the two tenacious environmentalist organizations Alpe Adria Green and of Greenaction Transnational, which never gave up and denounced the flaws of the project before all authorities, to the point the European Commission took action, the supporters of the project shifted away. Until the end, when (in the midst of the elections, no less) Italian politics predictably switched sides as it always does. All parties were against what, by that time, was a dead project. An easy turn, jut to collect votes and to make people forget what the same politicians had done until that very moment. And it worked just fine, to the point the mayor who had supported the LNG terminal won the election once again, also thanks to Trieste’s press which, for years, minimized the ongoing legal battle of the environmentalists against LNG terminal. The press had portrayed as nearly meaningless the main oppositions to the projects, which were brought forward by Alpe Adria Green and by Greenaction Transnational. A Slovenian environmentalist federation (Alpe Adria Green) to which belonged also Greenaction Transnational, the Triestine environmentalist movement that in 2011 had brought the questions of the Free Territory of Trieste before the European Parliament: for the very first time (LINK). An insight to the role of the two environmentalist groups in the question of LNG terminals in the Gulf and in the Port of Trieste comes from the documentation of the Italian Ministry for the Environment. In the public E.I.A. (Environmental Impact Assessment) of the Gas Natural project, Alpe Adria Green and Greenaction presented 20 out of 29 oppositions. After the shocking favorable opinion of the Italian Ministry for the Environment (2009), the two organizations denounced to public opinion the scandalous falsification of the environmental impact study, and requested, obtaining it, the intervention of the Slovenian Government, which declared to be against LNG terminals (LINK). 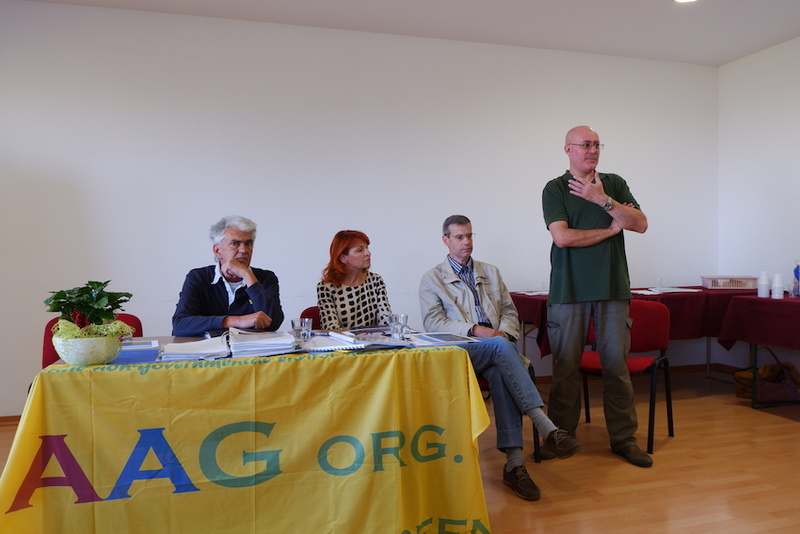 Alpe Adria Green and Greenaction did also denounce breaches in the E.I.A. (Environmental Impact Assessment) procedure before the European Commission and the European Parliament, as well as the breach of EU directives regarding the safety of major hazard industrial activities (Seveso Directive). Complaint addressed to Brussels authorities resulted in investigations, and infringement proceedings against Italy. Slovenia itself, like the two organizations, opened a dispute before the E.U. versus Italy. It was the first time in E.U. history that two Member States opened a dispute due to a failure to implement a crossborder E.I.A. (LINK). This is one more reason why Alpe Adria Green and Greenaction’s complaints constituted pilot procedures to improve E.U. legislation on the matter. On 22.01.2013 the project of the LNG terminal in the port of Trieste was brought before the European Parliament and publicly discussed (Committee on Petitions, a video, in Italian, is published at this LINK). During this hearing, for the first time, the appellant (Roberto Giurastante) raised also the question of the legal status of the international Free Port of Trieste, State Corporation of the present-day Free Territory of Trieste. 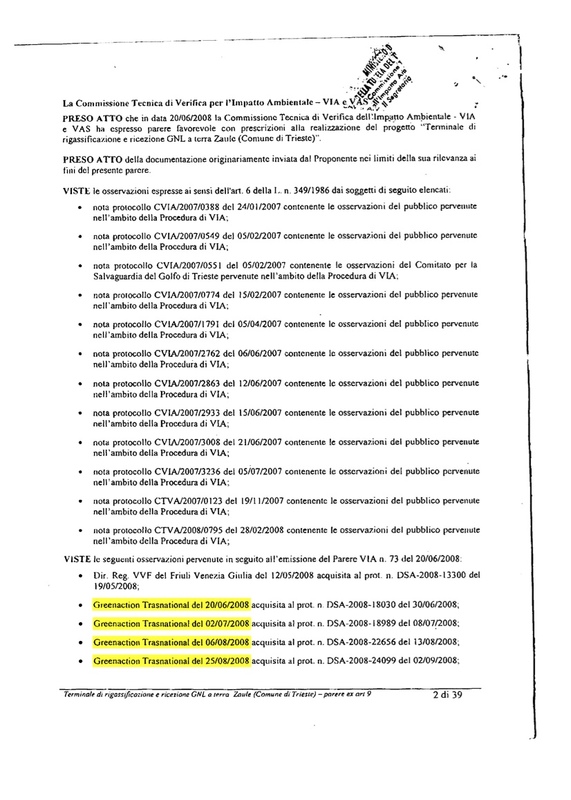 At the same time, Greenaction impugned before the competent Regional Administrative Court (that for Italian Region Lazio) the decree of the Italian Ministry for the Environment that declared the project compatible with the environment. The Republic of Slovenia joined the legal action. It is thanks to those action that the project of a LNG terminal in the Port of Trieste was frozen, and became harder and harder to carry on as the years passed. Year during which, the indomitable environmentalists of Alpe Adria Green – Greenaction were repeatedly reported to the authorities for “daring” to resist the lobbies of energy. It is these environmentalists to be the “unknown” heroes of this long struggle for legality. Follows the favorable opinion to the LNG terminals released by the E.I.A. Commission of the Italian Ministry for the Environment. Following its approval (Alpe Adria Green and Greenaction presented 20 unfavorable opinions out of 29) by the same Ministry, and regardless multiple breaches of the crossborder E.I.A. procedure, the European Commission and the Committee on Petition of the European Union were informed of the case.